Posted by Madeline Patton on February 10th, 2014 at 4:00am . Sinclair Community College colleagues Fred Thomas and Robert Chaney took an entrepreneurial approach to their National Science Foundation Advanced Technological Education project. They formed Learning with Math Machines Inc., a non-profit company that provides interdisciplinary professional development workshops and sells their math machines. The machines are small robots and gadgets that facilitate adaptation of calculators, personal computers, and other readily available equipment to allow students to see and experience tactilely what happens when they manipulate algebra and other math and science concepts. "If they [students] can express it algebraically they can see what happens immediately. It has an enormous effect on learning simply because they get immediate feedback. If it doesn't do what they want it to do, they don't have to wait for me to grade their paper," said Thomas. He's now retired from Sinclair and runs the day-to-day operations of the company as CEO. Chaney continues to teach math at Sinclair using the math machines they developed with an ATE project grant. In November, he was selected as 2013 Outstanding Community College Professor of the Year by the Council for Advancement and Support of Education (CASE) and the Carnegie Foundation for the Advancement of Teaching. His award-winning pedagogy will be the subject of the February 17 ATE@20 blog. Robert Chaney, left, and Fred Thomas began working out their ideas for simple machines to teach math and science concepts as part of the Sinclair Community College faculty team developing curricula for the Dayton, Ohio, college's ATE manufacturing center in the 1990s. This photo was taken at a Learning with Math Machines Inc. workshop in 2013. "We're different from anybody else. One of the ways is that our target audience is very, very broad," Thomas said. Also, they do not push a specific technology-oriented program. "Our whole focus is how the S and T and E and M of STEM fit together," Thomas explained. He and Chaney prefer to do Math Machines workshops together because it reinforces their interdisciplinary approach. "We honestly enjoy working together and think it's best if we're both there," Thomas said. Their strength, the men say, is getting math and science instructors to see that one important part of their role is to be "service departments" responsible for imbuing students with the skills they will need to excel in technology and engineering courses. Their goal: "Helping those groups understand better how to mesh technology and engineering with math and science curricula." Thomas and Chaney's collaborative thinking about STEM began in the mid-1990s when Sinclair got one of the first ATE center grants to create the National Center of Excellence for Advanced Manufacturing Education. Sinclair faculty joined the effort to develop interdisciplinary modules. Chaney was the cluster captain for mathematics; Thomas for the sciences. "It brought us together and gave us support and allowed us to work with other people. It gave us something that we could build on it. It was very important to me," Chaney said, adding, "It gave us the time and money to do something initially." Thomas liked learning at the annual ATE Principal Investigators Conferences. "Those meetings were always very important to me to get a sense of what other people were talking about, especially in those early years. STEM was really just being invented then as an idea. NSF was just beginning to accept the whole idea that there was a T in STEM, that it wasn't just science, engineering and mathematics at NSF. And ATE was where that was happening." Discovering, "We're on to something"
Thomas explained that "through the center grant we decided that, 'Hey we're on to something here, and it's really neat'." They got support from Discovery of Ohio and Tech Prep to continue working out their ideas. 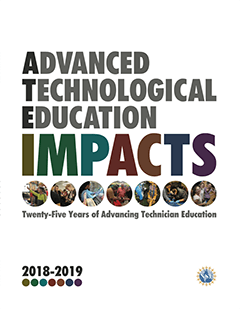 Then in 2002 they were awarded a $401,914 ATE project grant to develop and disseminate low-cost laboratory apparatus and authentic learning activities. Then as now, NSF encourages principal investigators to sustain their innovative work after their grants expire. When their Connecting Mathematics, Science and Technology project was done in 2005, Thomas and Chaney wanted to continue spreading their ideas nationally. Sinclair's administrators supported Thomas and Chaney's ideas, however, the college's mission requires it to focus on Montgomery County. To allow the professors to move forward without being hindered by legal issues, college officials agreed for the college to sell Thomas and Chaney the intellectual property they developed. Chaney noted Sinclair continues to be supportive of their work, and fosters a culture of innovation and collaboration among its faculty and staff. For a couple years Thomas and Chaney tried to make a go of it as the for-profit Math Machines, Ltd., but soon realized that status did not fit their goal to keep equipment costs low so more teachers would adopt it. This status also disqualified them from obtaining support from foundations or corporate sponsors. In 2007, they formed the non-profit 501(c)3 organization, Learning with Math Machines, Inc. For the past six years they have focused on sharing their ideas for active STEM learning with simple machines with teachers. Key aspects of their curricula can be downloaded from their website. Their SAM robot and other moderately simple machines are sold via the website. Currently, they are talking with potential partner organizations that they hope will help the high school educators who attend Math Machines workshops to continue using the hands-on, minds-on learning approaches. To other educators thinking about building businesses from their innovations, Thomas offers the following advice. "You need a clear view of what you want to achieve and you have to realize that it's going to take a lot of work to get there. You need a business plan with a realistic estimate of how much income you can generate. Non-profits need an income stream." Their Math Machines income is based on the workshops they present; neither man takes a base salary. They have found that it is most difficult to cover overhead costs. Funders want to support program results, not rent, utility bills, and liability insurance. Thomas and Chaney, like many non-profit leaders before them, have found that using volunteer labor and operating out of a home, in this case Thomas's home, keeps costs down. As a non-profit they have received funding from Honda of America Manufacturing and NSF. The $156,530 ATE project grant they received in 2010 provided 40 community college math and physics instructors with math machines and instruction in how to produce them in order to teach other educators how to build and use them. The project also produced, tested, and revised classroom activities. "It was the best workshop I've ever been to," Julie Bell replied when asked for this article about her Math Machines workshop experience. She is the math department chairperson at Mariemont High School in Ohio. Bell participated in the one-week workshop in the summer of 2013 with two Mariemont colleagues: a physics teacher and a computer science teacher. A Duke Energy grant covered the program's cost. Bell said her students "really, really enjoy" the Math Machines lessons she has incorporated into her Algebra II classes. "It was just really applicable to what I teach," she said. Her students have combined polynomials to light up lights and used logarithms to operate a function plane. Her most successful lesson coincided with her principal's observation of her teaching. The students first used calculators to program remote-controlled miniature cars. Then they had to gather data about how far their cars traveled and develop a line of regression to predict where they would stop. Finally, they had to revise their programs to make the cars stop in assigned places. "It involved a lot of math and was very practical for them," she said, adding that for students to manipulate the machines with their calculations "just made it very real for them." Every student questioned by the principal was able to explain in mathematical and scientific terms what they were doing. Bell was proud of her students and got a great evaluation. There are no comments yet for this entry. Please Log In to post one.